New technology helps but the "fun back into fitness"
The future of fitness may have arrived at Oak Park's Midtown Athletic Club. 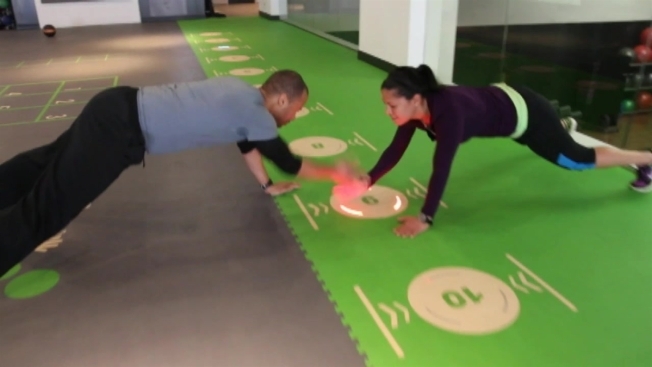 The athletic club has installed Pavigym flooring, a high-tech system featuring iPad-controllable blinking LED lights under the floor that directs users through a series of unique workouts. It's the first of its kind in the Midwest for the product which was originally developed in Spain. Midtown's fitness director Brian Lyons says it offers new options for people who are sick of the same old workouts. "There's a touch screen that gives you different patterns, and you can se t up competitions by yourself or against a team. You set a time and a wall lights up at random and you can throw a ball at the wall or touch the wall, it all depends on how fast you're doing the game," Lyons said. The programs track your results over time and allow you to pick any movement you want, but Lyons says the best part is the unlimited options it offers. "Random environments are great. We have to react to random stimulus in our every day lives, and this works on agility, gets the heart rate going and offers an experience that you won't get from strictly running on a treadmill," Lyons said. Chicago Bears players Kyle Long and Craig Steltz will be on hand to sign autographs.